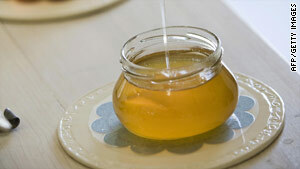 Suspected hazardous material at a California airport turned out to be honey. Los Angeles, California (CNN) -- The substance that spurred an evacuation at a California airport Tuesday was simply honey, the Kern County Sheriff's Department said. The security scare happened after Transportation Security Administration agents found what they believed to be a potentially hazardous substance inside a passenger's luggage. "None of the items inside the bag contained explosive or hazardous material, and the liquid inside the five bottles was identified as honey," the sheriff's department said in a statement. The Meadows Field Airport had been evacuated and shut down for several hours Tuesday morning after authorities found what they called a hazardous substance. The man whose bag was flagged, told authorities that he had honey packaged in five bottles, Deputy Michael Whorf, spokesman for the Kern County Sheriff's Department told CNN. The 31-year-old man cooperated with authorities and was released with no charges against him, Whorf said. The trouble started when two TSA agents were doing a routine swab of the man's bag, which tested positive for a hazardous substance, Whorf said. The agents who discovered the substance opened the bag and both became nauseated, Whorf said. They were transported to the hospital and later released. The preliminary tests using the swabs indicated the presence of the explosives TNT and triacetone triperoxide, known as TATP, Whorf said. The man told authorities that he was on a flight from Bakersfield, California, where he had visited relatives, back to his home in Milwaukee, and was carrying the bottles of honey back with him. Flights in and out of Meadow Fields resumed Tuesday afternoon.